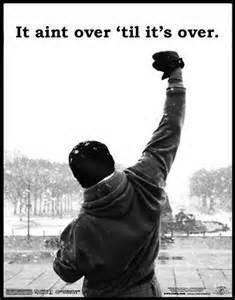 IT AIN’T OVER… UNTIL GOD SAYS IT’S OVER! I know many were concern that I wasn’t going to get back on the saddle… barely… but I got on it! Yes… my heart hurts a lot today… and I was stressed out ! As much as I didn’t have the desire to do anything but feel sorry for myself… I prayed and I semi got it together… Continue to saturate my ministry and myself in constant prayer! Thanks for the love and support…from the ones that genuinely cared and those wo silently prayed for me and my family …that’s when it counts the most!